If you were to fly over Enceladus’ southernmost regions, you’d witness a remarkable sight. With surprising frequency, this ice-covered moon spurts a plume of water into space—a telltale sign that a global ocean lies underneath. Scientists have struggled to explain how such a tiny moon could sustain enough energy to maintain a liquid ocean, but new research shows that a porous core could do the trick, and that Enceladus has been wet for billions of years—a potential sign of habitability. 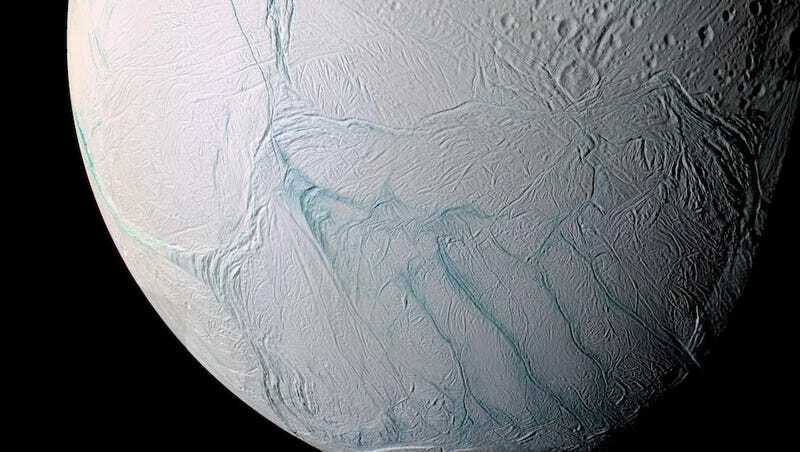 New research published in Nature Astronomy is the first to show how Saturn’s moon Enceladus is able to produce sustained hydrothermal activity along its rocky core and maintain a warm subterranean global ocean. Remarkably, the 3D models used for the study indicate that this process, which requires a wet, porous core, has been ongoing for potentially billions of years, an observation that bodes well for astrobiologists in search of microbial alien life. Enceladus measures about 310 miles (500 km) across and it’s completely covered in an icy shell. At its thickest, this ice runs about 12 to 15 miles (20-25 km) deep, but it thins to just a few miles over the southern polar region. It’s in these southern areas where Enceladus’ geysers can be found, spewing jets of water vapor and icy grains (some containing simple organics) through cracks in the ice. This moon is literally blowing its ocean into space, and thanks to the Cassini probe, we know this vapor includes salt and silica dust. But for these ingredients to exist, the temperature at the bottom of the ocean must be exceptionally hot. Because of what Cassini uncovered, we know there are some serious chemical reactions happening along the boundary that separates the moon’s liquid ocean from its warm, rocky core. “In order to explain these observations, an abnormally high heat power (>20 billion watts) is required, as well as a mechanism to focus endogenic activity [i.e. processes within the core] at the south pole,” write the authors in the new study. Exactly where Enceladus gets all this crazy amount of energy isn’t immediately obvious. The heat required is about 100 times more than what would be expected through the natural decay of radioactive elements within the core’s rocks. More plausibly, a major part of the process has to do with the moon’s host: Saturn. Enceladus spins around its gas giant along an elliptical orbit, where the constant gravitational pushing and pulling creates a tidal effect. At the core, this tidal effect produces friction, and by consequence warmth. Yet this is still not enough energy to counterbalance the heat bleeding off the ocean. By all accounts, this moon should’ve frozen over after about 30 million years, according to scientists. But it hasn’t, and because Enceladus is still extremely wet and active, something else must be going on. To find out, a team from the US and Europe, led by Gaël Choblet from the University of Nantes in France, ran a series of 3D simulations to see what’s going on inside this moon. “Where Enceladus gets the sustained power to remain active has always been a bit of mystery, but we’ve now considered in greater detail how the structure and composition of the moon’s rocky core could play a key role in generating the necessary energy,” says Choblet in a statement. According to the models, the only way for Enceladus to maintain a liquid ocean is by having a core made up of unconsolidated, easily deformable, porous rock. With a highly permeable rocky core featuring upwards of 20 to 30 percent empty space, cool liquid water can rush in and get warmed by the tidal friction (temperatures at the core can reach as much as 363 Kelvin or 90 degrees Celsius). When the water gets hotter than its surroundings, it rises and gets flushed out of the core via narrow cracks, similar to hydrothermal vents at the bottom of Earth’s oceans. This process repeats itself creating a hydraulic cycle of sorts; every 25 to 250 million years or so, the entire volume of Enceladus’ ocean goes through the moon’s core. Incredibly, this activity can be maintained for billions of years, according to the models. This study, says NASA Astrobiology Institute scientist Christopher Glein, provides a solution to an important problem: how to make hydrothermal systems inside a small icy moon. Indeed, in addition to having warm water, organic molecules, and other “building blocks” of life, it’s had an ocean for potentially billions of years—enough time (at least in theory) for simple microbial life to emerge. But we’ll only know by exploring this moon even further. Likewise, Hunter Waite, the program director for NASA’s Space Science and Engineering Division, says the research makes sense, pointing to a study he co-authored earlier this year. “Dissipation of tidal heating within the rock is an important factor in hydrothermal activity and hydrogen production as discussed in our Science paper on molecular hydrogen production,” he told Gizmodo. The new study, while it explains Enceladus’ liquid global ocean, internal heating, thinner ice at the south pole, and hydrothermal activity, doesn’t explain why the northern polar region features ancient ice covered in craters. The models predict thinning at both poles, so something else is going on that still needs to be studied.